When I was contacted by Living Nature and asked if I would like to try some products, I couldn't have said yes faster! I had seen a few reviews on other blogs about their Skin Minis (my thoughts on them coming soon) and had browsed the site so was fairly familiar with the brand. They are New Zealand based, founded in 1987 and working out of Kerikeri. They work with 100% natural ingredients, producing skincare and makeup for all skin types. I was consulted before they sent me the products, ensuring I was getting the right products for my skin. 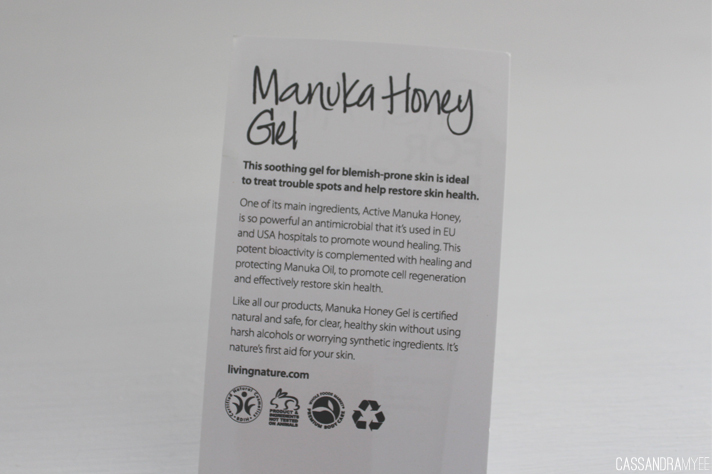 I am oily/combination and blemish prone; with that in mind they were kind enough to send me this little wonder product the Manuka Honey Gel*, aimed at trouble spots. 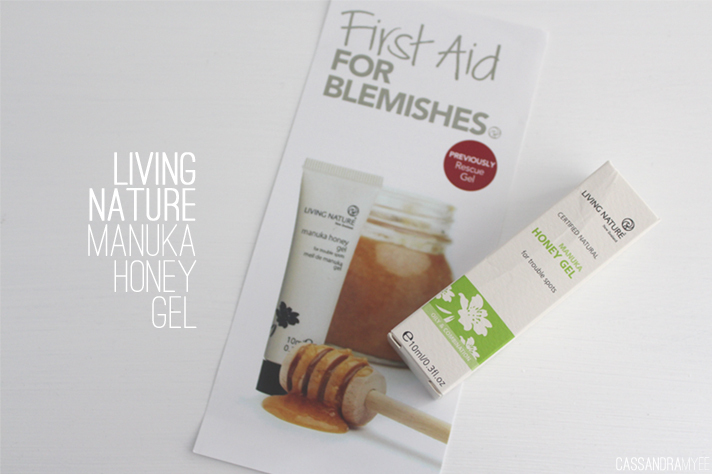 I was very intrigued about this and was unaware of the amazing benefits that manuka honey has for the skin. The Living Nature website has an extensive glossary filled with all the information you could possibly want (here), but I will try and sum it up in a couple of sentences. It comes from the nectar of the NZ Manuka flowers and is a natural antimicrobial meaning that is stimulates healing and promotes healthy skin. Not only does it treat blemishes it also helps in the act of cell repair and reducing scarring. It's a bit of a do it all ingredient! I was sent a 10ml tube and it has lasted me for nearly 1 and a half months now and it's still going strong. I use it pretty much every night on areas where I have breakouts and scarring (mostly my chin, ahh hormones...) but it can also be used as a spot treatment throughout the day as needed. It definitely has a strong manuka scent, which took a little to get used to, but the skin benefits really out-weight the smell. It is a very liquidy gel and feels very light. A little goes a long way with this and I just use a dab and that is all I need each time I use it. 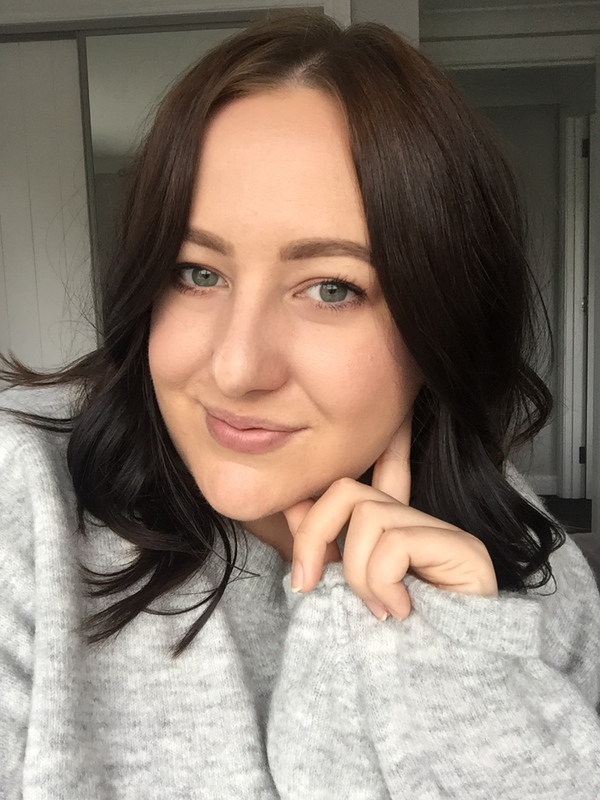 I put it on my skin as the final step in my routine once I have moisturised and it settles into the skin very quickly - I feel that it works best over night when your skin is naturally repairing itself anyway. The next morning I really notice a difference with any spots I have; they are reduced, not as red and scary looking and it also clears them up so much quicker then other spot treatments I have tried. I am so glad I had the chance to try this and I know I will be purchasing it when I have run out. If you are blemish prone and want something natural that is also extremely effective, this is worth a try. You can purchase it from the website; NZD $32.00 for 50ml, or $19.50 for 10ml. 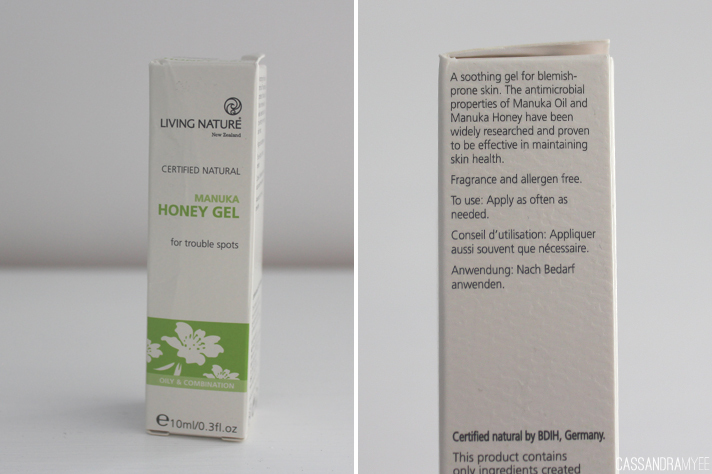 Have you used Manuka products before, or any from Living Nature? I'd love to hear your thoughts on their range. *This product was sent to me for consideration to review, however all thoughts and opinions are entirely my own.